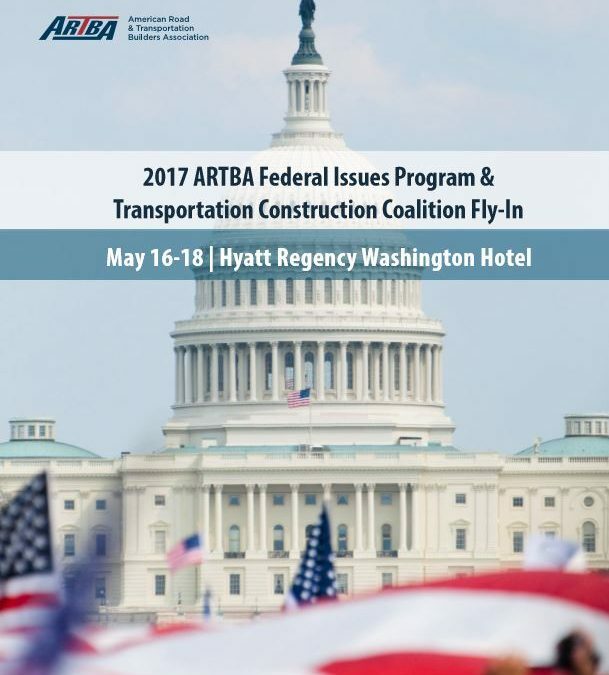 ARTBA’s Federal Issues Program (FIP) and the Transportation Construction Coalition (TCC) Fly-In will be laser-focused on pushing a permanent revenue solution for the Highway Trust Fund (HTF) as Congress considers overhauling the U.S. tax code and President Donald Trump continues to call for at least $1 trillion in infrastructure investment. The annual events are May 16-18 at the Hyatt Regency on Capitol Hill. ARTBA senior staff will also provide legislative and regulatory updates, and a transportation construction market conditions report. Confirmed speakers for the TCC Fly-in on the afternoon of May 17 include Senate Environment & Public Works Committee Chairman John Barrasso (R-Wyo. ), House Transportation & Infrastructure (T&I) Committee Chairman Bill Shuster (R-Pa.) and T&I Ranking Member Peter DeFazio (D-Ore.). The insights from these sessions and speakers will be important as ARTBA and TCC members meet May 18 with their members of Congress. See the full schedule of meeting and events for the FIP and TCC Fly-In. Register here.